There is a fruit and vegetable shop around ten minutes away from our flat in Glasgow. What first drew me in were the turmeric-coloured petals on bunches of sunflowers, arranged in buckets outside the front door. Next it was the unusual fruits piled high in boxes and soon we explored inside to find delicious pork and apple sausage rolls behind the counter. A large lime was also purchased, intended to dress an avocado destined to be smashed on toast. But the pink strips of rhubarb, bundled in a box took my breath away. I’d never seen such perfect forced fruit before. Any time I’ve cooked with rhubarb it’s been spindly, green with a blush hue and terribly sharp. But this was a box of pure sunshine brightening a damp Saturday. I knew it was destined for bigger things than topping some yoghurt and granola, and so I made a cake. I find colour to be so inspiring when baking, and of course fruits are a veritable rainbow to pick from when adding to butter and sugar. I love the way blueberries pop and pool into purple puddles under crumble or how granny smiths shed their lime green skins to be doused in pearly white sugar to sweeten their sourness to fill a pie. Yet forced rhubarb, grown in the rhubarb triangle in Yorkshire which sounds like a fairy story in it’s own right, feels unique in its hue. And it’s arrival in this little shop signalled that spring was finally due. A cake made in a saucepan feels rather novel, but this one bowl method produces a beautifully soft cake with a crumbly texture that complements the fruit of the season. With my friend Victoria in mind, I adapted Isy’s recipe to make it gluten free and found it to be just as delicious. 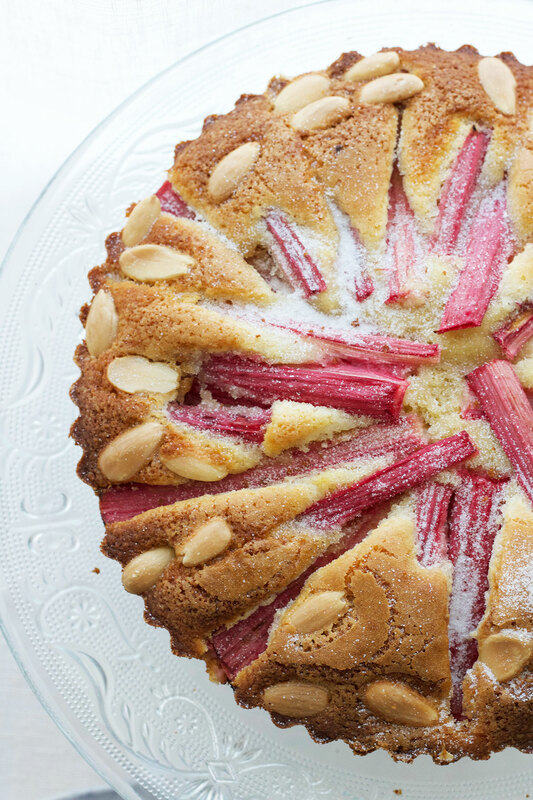 The almond sponge is soft and the stalks of rhubarb are sticky and sweet thanks to plenty sprinklings of sugar. Since making this cake, our spring was delayed somewhat by blasts of snowstorms from Siberia and it’s only taken till now for the last patches to melt away. 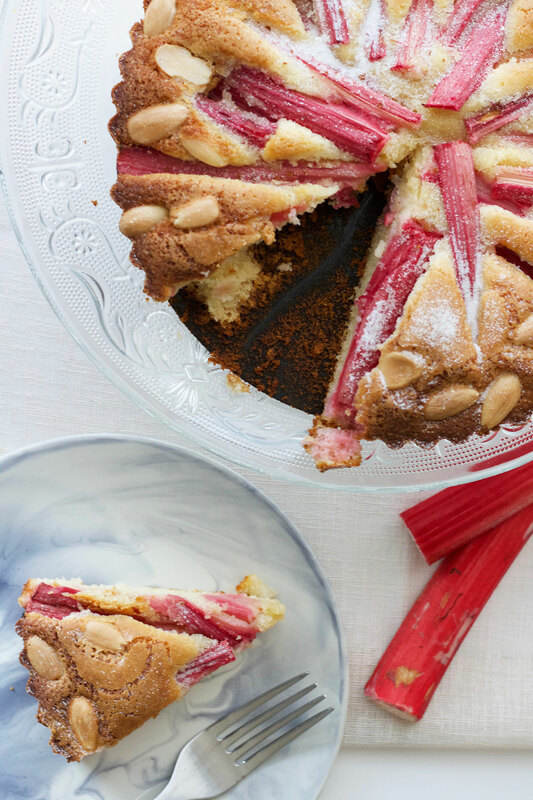 With fingers and toes crossed, winter will soon be over and slices of this rhubarb cake will sing that a new season has arrived. Preheat the oven to 200oc/180oc fan and place a 23cm fluted tart tin (or similar sized round cake tin, preferably springform) on a baking tray. In a large saucepan, melt the butter then set to one side to cool slightly. Using a pastry brush, paint the insides of the cake or tart tin with a little of the butter to ensure the cake comes out clean. To the saucepan add the salt, almond extract and the milk and stir together. Add the egg, ground almonds and sugar and mix again until well combined. Fold in the rice flour and baking powder then pour into the prepared tin. Wash and cut the rhubarb into stalks around 10cm long, cutting any thick pieces in half then arrange in a circle on top of the cake batter. 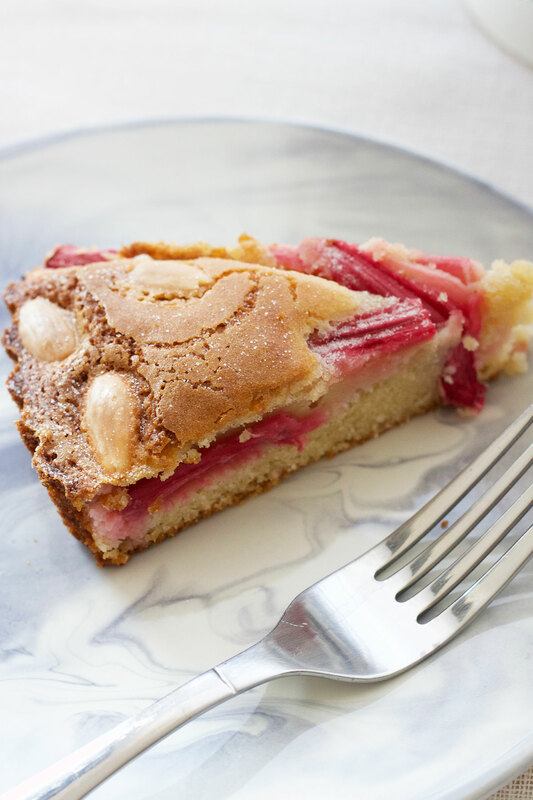 Scatter blanched almonds around the edge of the cake then sprinkle caster sugar over the cake to balance the rhubarb’s sourness. Bake in the oven for around 40 to 50 minutes until a skewer inserted in the middle comes out clean, taking care not to pierce through the fruit. Remove from the oven and leave the cake to cool in the tin. Once ready to serve, carefully remove the cake from the tin and serve in thick wedges. The cake is best eaten the day it is made. 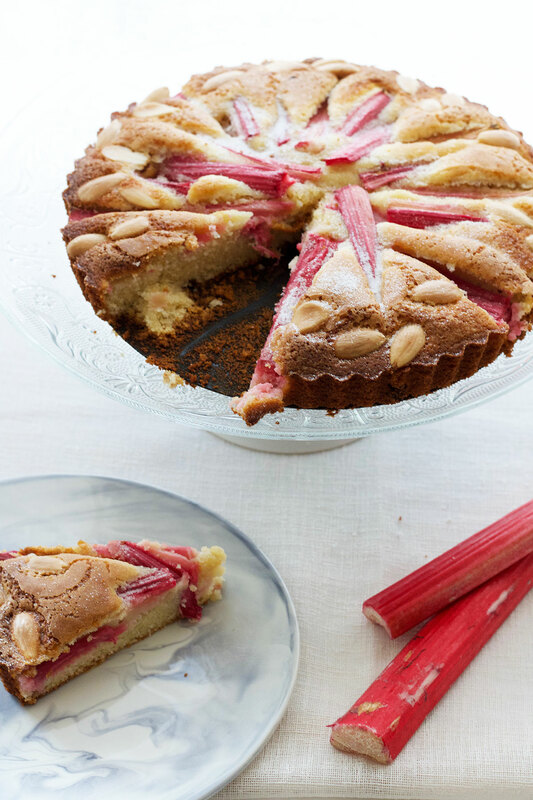 Thanks love, it was dreamy – I need to find some more rhubarb and make it again! It’s delicious in all kinds of sweets and baking! Oh wow, this looks incredible!! I LOVE rhubarb when it’s in season. Need to make this. Thanks Leigh, hope you like it! Yum, this sounds fantastic! Definitely saving to try! Thanks Brandy, hope you like the recipe! This rhubarb pie looks yummy! 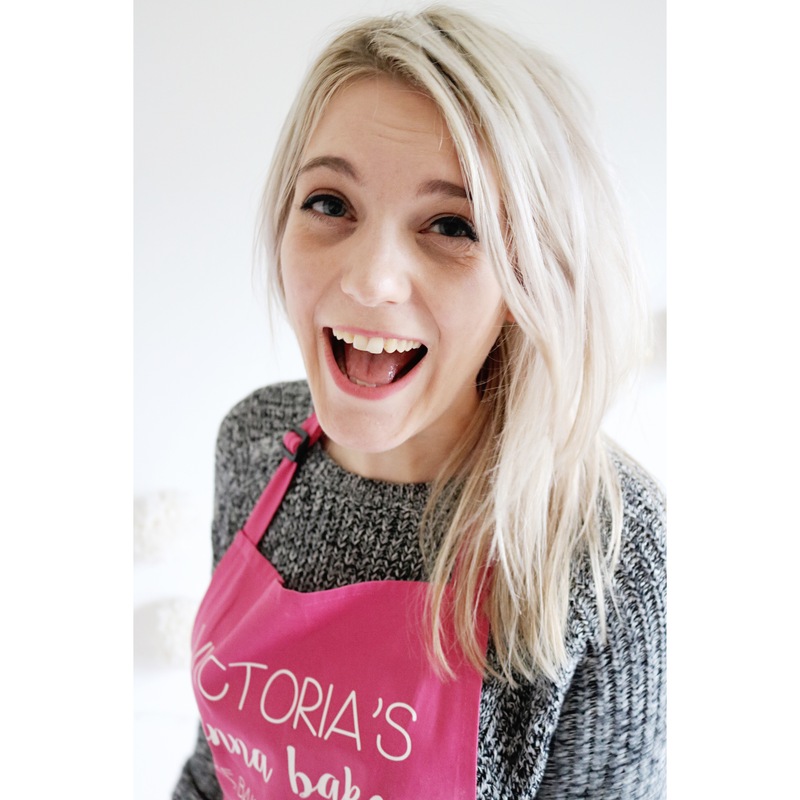 I just discovered your blog and can’t wait to start making some of the tasty finds you’ve got here. I love rhubarb! Can’t wait to try this! Thanks ! Thanks Jen! Hope you love it!